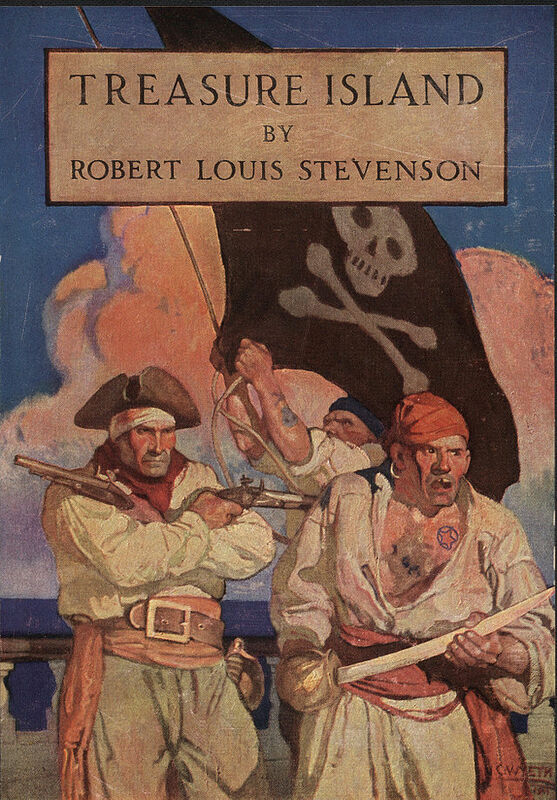 We tackled another classic as part of our homeschool reading curriculum, Treasure Island. I knew the antiquated language would prove plenty challenging for my tween boys, but I really wanted them to experience the original instead of an abridged version. So I read it to them. It was a good move. Treasure Island is classic adventure story. Pirates, treasure, suspense, a dangerous voyage. It’s right up a boy’s alley. My guys ate it up. I had to explain some vocabulary. And there were plenty of times, especially when the pirates were talking, that the vernacular got pretty crazy. At those moments, I plowed through and then gave a brief explanation the end of the paragraph. They enjoyed the sound of the old pirate words, even if they couldn’t always follow the train of thought. I enjoy the language because it’s so colorful and inventive without being crass. We sometimes had to stop and discuss the characters as we went along. They needed some guidance on who were bad guys and who were good guys. Long John Silver is a particularly dynamic character, deceptive and sneaky but so charming. I helped them locate clues in the text to sort out motives and then make predictions about what Silver was really up to. Once they identified personalities and motives, my boys had no trouble following the characters through all the twists and turns, and, yes, violence. An awful lot of fellows meet their demise in this one, good guys and bad guys alike. It’s not terribly bloodly, but the pirates are pretty horrible, greedy, callous individuals. So this brings up a really good question…if it’s so difficult and so violent, what age recommendations would I make for Treasure Island? As far as an independent reading level, unless your child is an exceptional reader, you should probably save it for junior high. The old language makes for tricky reading, and you really have to follow carefully in some parts to understand that slippery fellow, Silver. As far as graphic content, it’s not terribly bloody for all the violence. And I actually appreciate that pirates are portrayed realistically, as the nasty outlaws they were. Long John Silver is not an eccentric, loveable Jack Sparrow. He’s evil. So I’d probably say seventh grade for independent reading, but as a guided read aloud, third or fourth grade should be fine. Thumbs up for this old-fashioned boy adventure. It was not an easy read. It required some explaining and some critical thinking, but we all enjoyed the adventure. There is historic and literary value in a book that has stood the test of time. I think it’s worth a little effort to mine out the gem. Great review! I’ve never managed to read “Treasure Island,” because of the theme and violence. Somehow it didn’t appeal to me. It is a classic and one I should read someday. It’s good that you read it with your kids. I still can’t see this one appealing to you, Pat. But my guys have been waving the Jolly Roger and wearing hankies on their heads for years. It was good for them to see pirates really aren’t heros. I remember doing exactly the same things with my boys! We were surprised to find it as fast-paced as it was. I’ll be interested to see if parents of girls find that it grabs them just as much. I’ve got some nieces that I just can’t see enjoying this one yet. Maybe as they get old enough to realize there’s value in the historicity, as well. It´s wonderful that you are sharing come classics with your boys. They are truly getting an excellent education. Bravo to you. Lol, my low readers get a full three hours of reading in some form every school day. They don’t have a choice but to improve. I remember reading the classics with my kids, brings back nice memories. Thanks for stopping by, Marcia. There are stories worth sharing hiding in those old books.